Milan attraction-guides.com - Milan, Italy attractions guide Milan Castello Sforzesco (Sforza Castle) information about attractions, history, fortress, ducal palace, Renaissance, museum centre, works of art, frescoes, Rondanini Pieta, Michelangelo, Filerete Tower, location and address, general tourist information about Castello Sforzesco (Sforza Castle) in Milan (Milano) area, Italy (Italia) IT - Last updated 30/10/2012. The Sforza Castle dates back to 1368, when it was constructed by Galeazzo II Visconti as a large fortress. Located on the north-west side of Milan, the Castello Sforzesco (Sforza Castle) has an interesting history. Later enlarged during the 14th century, when it was converted into an impressive ducal palace, the Castello Sforzesco (Sforza Castle) was partly demolished in the mid-15th century and a few years later, Francesco Sforza, the Lord of Milan, restored the castle and transformed it into one of the most magnificent Milan residences in Renaissance Italy. 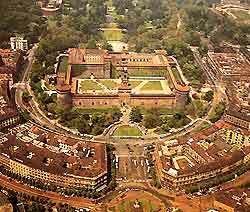 As the years passed, Milan's Castello Sforzesco began to fall into decline and at one stage even resumed its original military function. Almost demolished completely, Luca Beltrami saved the castle and restored it during the late 19th century. Now housing an important museum centre, Milan's Castello Sforzesco (Sforza Castle) contains many interesting attractions, including the Ducal chapel, with original frescoes painted in 1472, Rondanini Pieta, Michelangelo's final piece of work which was left unfinished, and the Filerete Tower, which collapsed in 1521 following an explosion, being rebuilt many years later in the early 20th century.